You’ve heard the saying “everything’s connected.” This is especially true when it comes to the human body. Although there are many individual parts in a body (cells, organs, tissues, enzymes, etc. ), all different parts work together as one. A malfunction in one part of the body can cause the rest of the body to malfunction, and the strength of one organ can affect the strength of another organ. It’s no surprise that the digestive system is directly linked to the immune system. Whether or not the immune system is at it’s peak depends on the healthiness of the digestive tract. 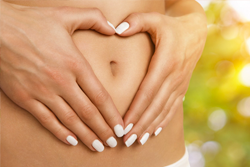 The digestive system is responsible for your overall well-being. It breaks down the food you eat into essential nutrients that help repair cells, stimulate growth, and give your body energy. The digestive system also protects your body from harmful invaders that could disrupt healthy living. There are bad bacteria present even in the most nutritious foods you eat that the digestive system is constantly fighting. In order to do this, good bacteria in the gut, specialized immune cells, and hormones work together to keep the GI tract at its optimum level. What happens when you you have an overpopulation of bad bacteria in your gut? Bad bacteria does exist inside your gut but the good bacteria balances it to keep your digestive system at homeostasis. When there is an imbalance in your stomach, irritation forces the pores in your small intestine to open up and leak undigested particles of food and toxins out into your blood. What was supposed to stay in the intestines will be let out, disrupting the normal food process in the body. You can imagine what happens when the nutrients your body needs don’t get properly absorbed while toxins and food particles escape to the bloodstream. The immune system immediately perceives these food particles to be invading antigens and hike up their response to attack these food particles, releasing histamines (The body reacts in a similar response when harmless pollen enters into the body). This results in unwanted symptoms like bloating, cramps, stomach ache, indigestion, irritable bowels, and food sensitivities. Remember that phrase “everything’s connected?” Well, here it comes again. Aside from bloating and cramps, you might experience moodiness, fatigue, eczema/a chronic skin condition, and joint discomfort. This is because irritation in the gut affects all parts of the body. The gastrointestinal system has one of the most abundant amount of regulatory neurotransmitters in the body. Serotonin, a chemical and a neurotransmitter that influences mood, is concentrated in your gut. It’s no surprise that bad digestion also affects your mood. How does bad bacteria overpopulate in the gut? Processed foods and sugar damage the good bacteria in your stomach. Added preservatives in foods, alcohol, drugs, and even stress can also throw your flora off-balance. In addition, a regular intake of antibiotics decreases the level of good bacteria, or probiotics, in your gut. How can you restore the good bacteria back into your gut? Consuming foods that contain probiotics is a good option to increase the healthy bacteria in your gut. Foods that have probiotics include yogurt, kefir (a mix between yogurt and milk), fermented teas like kombucha, kimchi, blue algae, soymilk, olives in brine, and pickles. Taking probiotic supplements is also an effective way of bringing your flora back to homeostasis. Digestive enzymes also help to break down foods in our stomach in order to absorb the nutrition. Sometimes the foods we eat may be too difficult for our body to digest. Taking a supplement like DIGESTSolve 24/7 that contains probiotics AND digestive enzymes is a good solution to aid the digestive process. Enzymes like protease break down the protein and carbohydrates that you eat, amylase breaks down starch, and lactase helps digest milk and dairy food. Glucoamylase and malt diastase also help with overall digestion of your food. Omega-3, found abundantly in fish oils, is also good for reducing the irritation in your gut. Glutamine can help heal the damaged lining of your intestines due to inflammation and enlarged pores. The essence of good digestion goes back to eating a balanced and good diet. Cut out sugar and processed foods. Ween yourself off of alcohol. Replace fast-food with wholesome salads, meat without injected antibiotics, whole grains, and organic fruits and vegetables. Good food is connected to healthy living! Wickham, E. (2015, Febuary 18). Retrieved May 13, 2015 from, http://www.livestrong.com/article/316406-what-is-the-purpose-of-probiotics.